Pope Francis offered his support to the Little Sisters of the Poor in a quiet visit to a group of nuns fighting back against the Obama's administration's birth control mandate included in the Affordable Care Act. The visit, according to Father Federico Lombardi, a papal spokesman, confirmed that the Pope's appearance was a sign of support for the Little Sisters in their legal fight. Last month, The Little Sisters of the Poor were granted a short-term exemption from the mandate by the Tenth Circuit Court of Appeals, where they are hopeful their case will be heard by the U.S. Supreme Court. "The Holy Father spoke to each of us individually, from the youngest postulant to our centenarian, and then he spoke to all of us about the importance of our ministry to the elderly," said Sister Constance Veit, Communications Director of the Little Sisters of the Poor. "We were deeply moved by his encouraging words." The Obama Administration has aggressively fought the Catholic group in their petition to be exempted from purchasing health plans for employees that cover birth control. Kishore Jayabalan, director of Istituto Acton in Rome, said in an interview with the Christian Post, that the Pope's pledge of "solidarity" with the nuns is "very important." "It was very important that Pope Francis made an unscheduled visit to the Little Sisters of the Poor, showing solidarity with them in their fight against the Obama administration, said Jayabalan, who previously worked for Vatican's Pontifical Council for Justice and Peace. "He showed with his actions that he is on the side of the underdog against the behemoth of Obamacare and encourages us all to continue the fight against the powerful," declared Jayabalan. "It was a very pleasant surprise visit that I'm certain brought joy to the Little Sisters of the Poor. I think it was incredibly Christ-like in many ways." 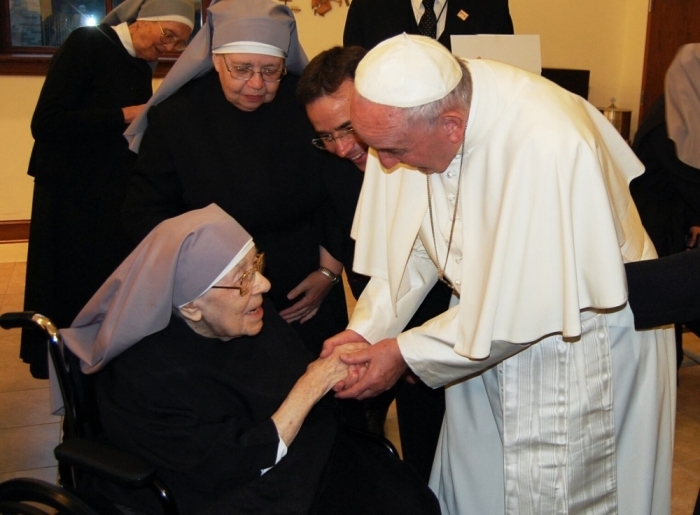 "After Mass at the Basilica, the Pope made an unscheduled visit to the Little Sisters of the Poor where he spoke to each of the Sisters privately and encouraged them in their vocation to serve the elderly and the poor," declared Rienzi. "Earlier in the day, at the White House, the Pope expressed his support for religious liberty when he stated: [we] all are called to be vigilant, precisely as good citizens, to preserve and defend that freedom from everything that would threaten or compromise it." On Thursday Pope Francis spoke to a joint session of Congress, where he called for the protection of life at all stages, linking abortion and disregard for life as a violation of the Golden Rule taught in Scripture. Pope Francis called for abolition of the death penalty, better care for the environment, and for protection and flourishing for families. "It is my wish that throughout my visit the family should be a recurrent theme," declared Pope Francis. "How essential the family has been to the building of this country! And how worthy it remains of our support and encouragement! Yet I cannot hide my concern for the family, which is threatened, perhaps as never before, from within and without." "Fundamental relationships are being called into question, as is the very basis of marriage and the family. I can only reiterate the importance and, above all, the richness and the beauty of family life," he added. Rev. C.J. Rhodes, who pastors Mt. Helm Baptist Church, the oldest black church in Jackson, Mississippi, believes all Christians can learn from Pope Francis's visit and remarks. "As a National Baptist pastor and theologian, I often lament that we seldom have a coherent and comprehensive social doctrine," declared Rev. Rhodes. The Roman Catholic Church does. And in Pope Francis' visit to our polarized nation we are reminded of how valuable such doctrine is." Rev. Rhodes cautioned Christians against using the Pope's message to fall into the trap of making his visit and words as another opportunity to focus on politics. "In humble gestures he has invited us toward a broader moral horizon that transcends the imaginatively shallow Left/Right divide," said Rev. Rhodes. "His consistent life ethic, or what Pope John Paul II called the 'culture of life,' teaches us that overcoming abortion, the death penalty, racial injustice, environmental abuse, attacks on traditional families, and oppressive political economies is indeed the work of the Church and makes the Gospel visible for the common good. "As Lino Rulli of Catholic Radio said, this Christian tradition teaches us that what matters most isn't left and right but right and wrong. We are Christians first, then Americans, pilgrims and ambassadors of our Lord and Savior Jesus and his kingdom. The Pope reminds of us that."